Thanks to Dr. Wafaey Fahmy Badawy Mohamed, Sharurah Armed Forces Hospital (Saudi Arabia), for contributing this case. To contribute a Case of the Week, follow the guidelines on our Case of the Week page. As the Rabbit Monoclonal Antibody (RabMAb�) technology leader, Epitomics is pleased to provide EP Clones, a line of high quality RabMAbs with superior binding affinity and specificity for anatomic pathology. We are now offering 28 EP Clones with antibodies for prostate cancer, lymphoma, and breast cancer targets including: ERG, PU.1, and PR, among others. Click here to view our products or visit us at epitomics.com/diagnostics for our complete product listing. 1) We now offer Medical Website Consulting services, to help make your website more effective, using our 12 years of experience in creating the world's most popular pathology website. Contact Dr. Pernick at 248/646-0325 or NatPernick@hotmail.com for more information. 2) We have posted a new article on our Computer Systems - AP/LIS page by Michael Mihalik: What Is an Anatomic Pathology / Laboratory Information System. 3) We have recently updated these topics in our Stains chapter based on the reviews by Lauren N. Stuart, M.D. : h-Caldesmon, CD31, CD34, FLI1, Fontana Masson, INI1, MITF, and Tyrosinase. 4) We have also updated these topics in our Stains and CD Markers chapters based on reviews by Nat Pernick, M.D. : AKT1, arginase1, beta-catenin, CCR9, CD25, cathepsin K, CDK4, and RAD51. If you have expertise in, and are interested in reviewing stains or CD markers, please take a look at our new Stains in Review page to see how you can contribute. A one year old boy was diagnosed clinically with left undescended testis. On examination, there was a firm nodular area near the external inguinal opening. Excisional biopsy of suspected area was done with part of the adjacent spermatic cord. Gross examination showed a 2.5 cm cord-like piece of gray tissue. The first two micro sections below are from the spermatic cord and vas deferens. 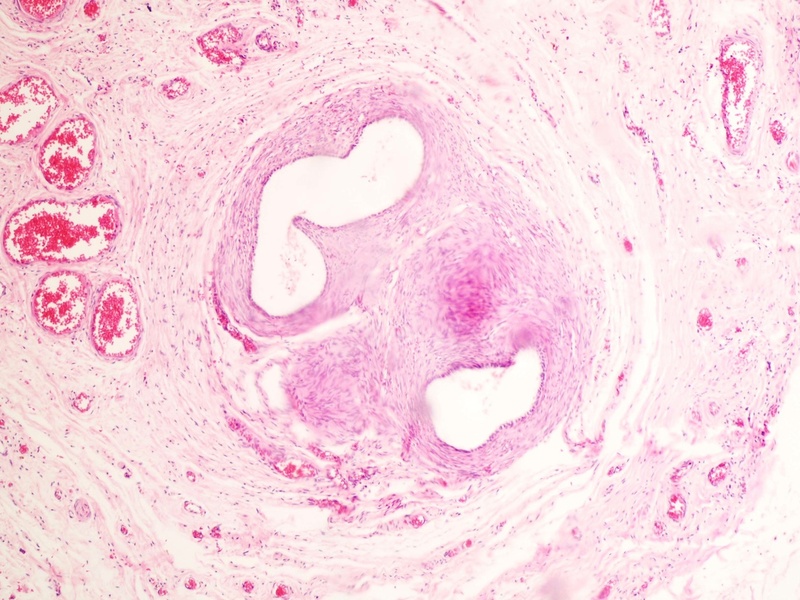 The first image shows a spermatic cord with blood vessels, lymphatics and a vas deferens duct, adjacent to a "vanishing" testis. The second image shows a relatively normal appearing vas deferens. 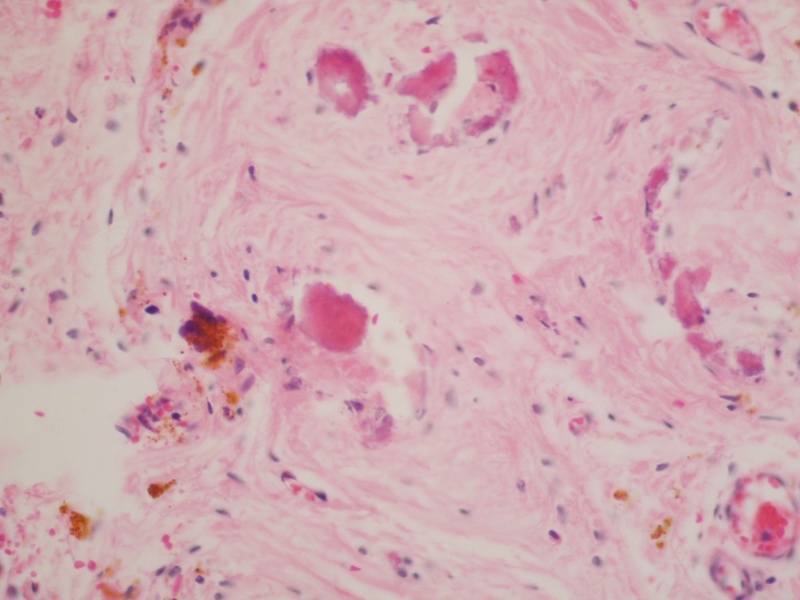 The remaining images of testicular tissue show fibrosis, hemosiderin, hemosiderin-laden macrophages, calcification and dilated vessels. 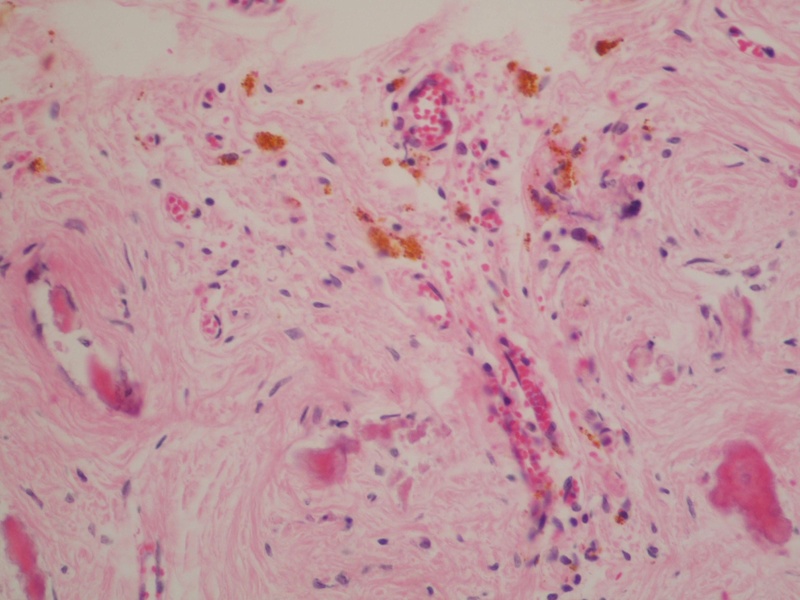 Ghosts of fibosed seminiferous tubules are also present. These features are consistent with testicular regression syndrome, which occurs in paucigonadal or agonadal individuals with male, female or ambiguous phenotype. 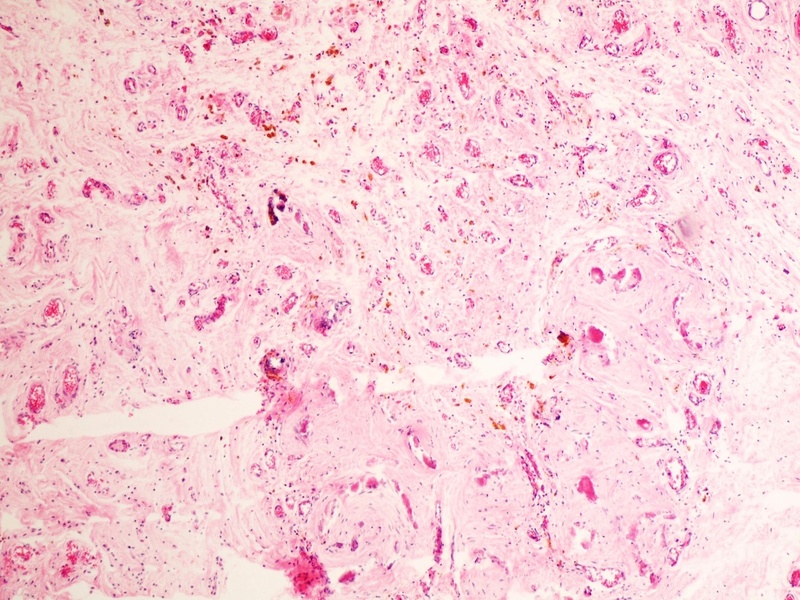 Patients either have no gonadal or testicular formation or regression of testicular tissue with a residual fibrovascular nodule (mean 1.1 cm), calcification and hemosiderin, as seen in this case. Typically, a rudimentary epididymis and spermatic cord are present. 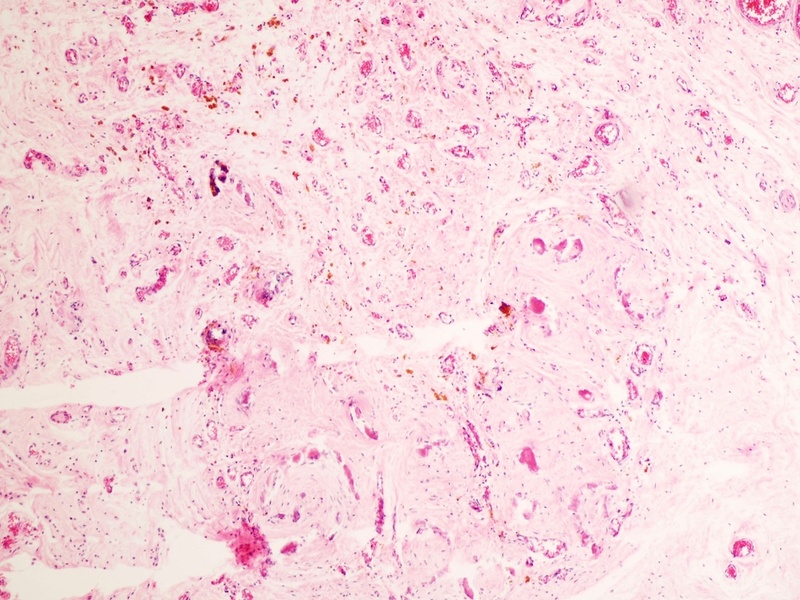 A vanishing or regressed testis affects ~5% of patients with cryptorchidism (Arch Pathol Lab Med 2000;124:694). 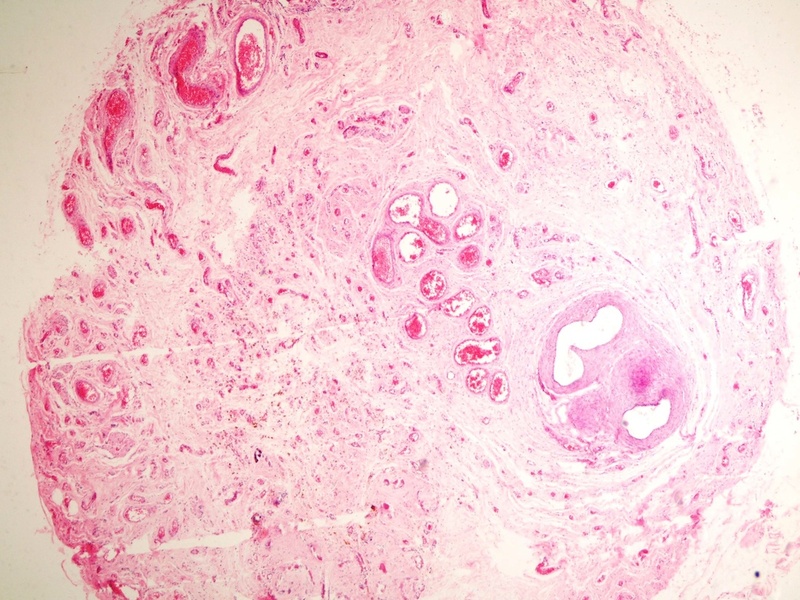 Residual testicular tubules are found in less than 10% of cases, but seminiferous tubules and viable germ cells in testicular remnant tissue have occasionally been reported (Urology 2007;70:1204). 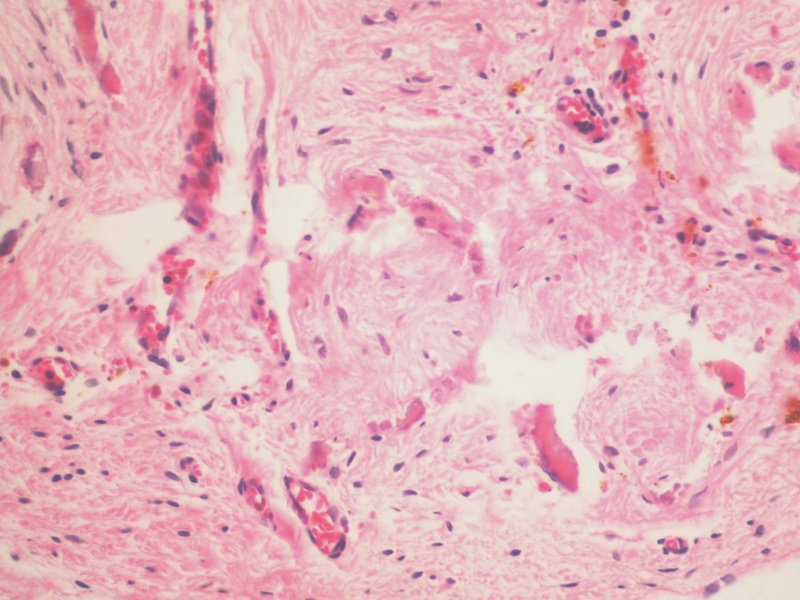 Although ITGCN or germinal dysplasia has not been reported, there is a theoretical risk of malignant degeneration, and excision of testicular remnants is recommended (J Clin Res Pediatr Endocrinol 2012;4:116-20).